← The Weekend is here! Let the Games… begin! 1. Begin with your complete menu. 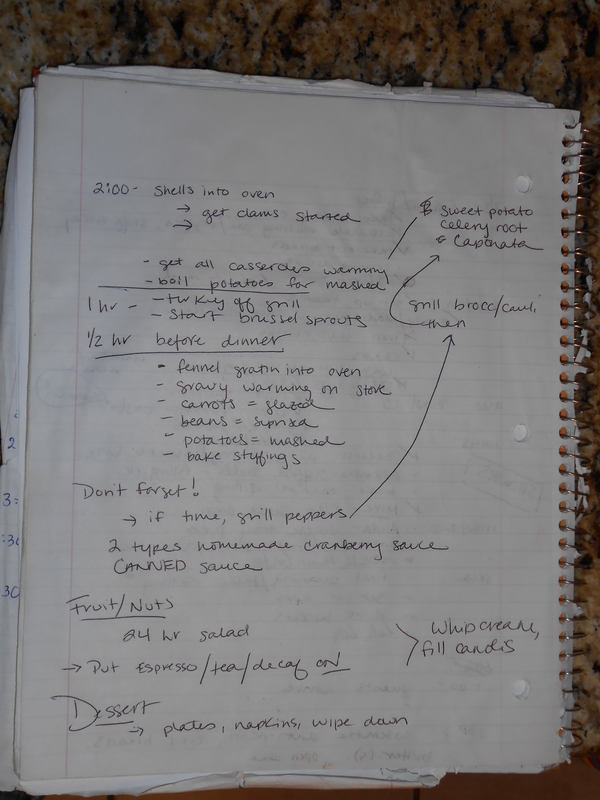 Write everything out and be sure that it makes sense- remember when we discussed complementary flavors and textures? Keep that in mind when committing to your dishes. 2. Identify dishes that can be made ahead. Casserole dishes, breads, soups, etc- what can be done soon and frozen until Thursday? What can be assembled on Tuesday? Wednesday? The more you can accomplish before Thanksgiving the easier the actual day will be. 3. Create your grocery list. I organize mine by section of the grocery store. 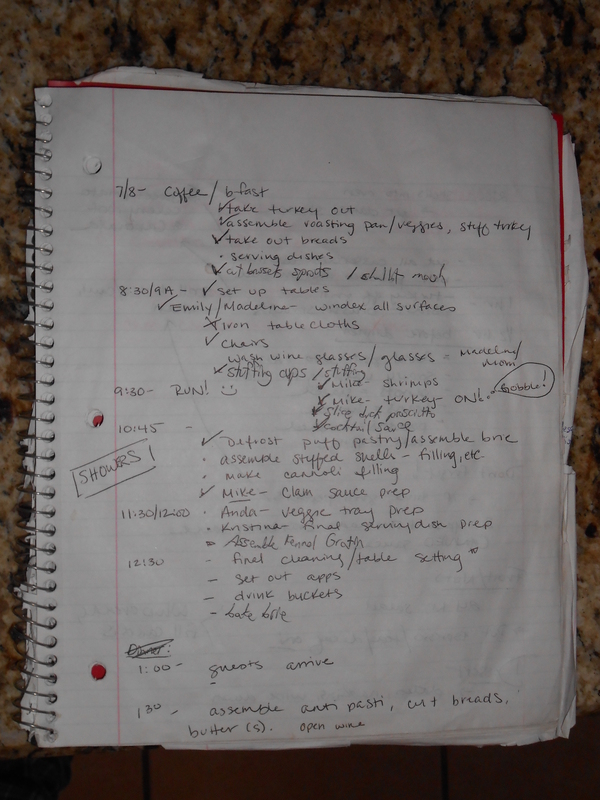 If you know you are going to the market a couple of times (maybe you need to purchase seafood the day before) make lists for each store/day that you are going. 4. Make your plan. Begin by itemizing and prioritizing the items that you are doing ahead. If that means that today you are going to make pie dough and breads, write it down! It will feel amazing to cross the tasks off of your list. We make a list of things/tasks/recipes that need to be attended to for each day this week. Kristina- begin chopping celery, carrots, onions, etc for items being assembled Wednesday. Place into labeled bags in the fridge, by dish. The day of the event we make a detailed timeline organized by hour and person responsible for each task so that both Mike and I know where we are headed and what’s next at any given moment. Doing this has avoided fights, “I thought YOU were doing that”, etc. approx 5:00- fruits/nuts, turn over to Dessert. Get Coffee/Espresso going. Within this timeline, Mike and I also divvy up who will “finish” each dish and do any last minute assembly. 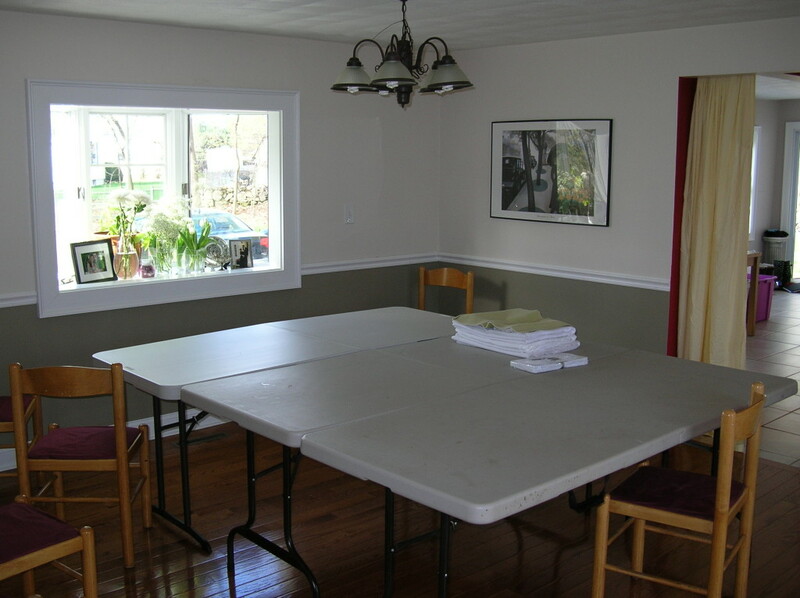 For all big parties, Mike sets up an extra folding table in the kitchen and I use this as a staging area. You need every inch of surface area in your kitchen on this day! This photo is from a dinner party, but note the large plastic bins underneath the table! Filled part-way with water and dish soap, dirty dishes go here to wait their turn in the dishwasher. 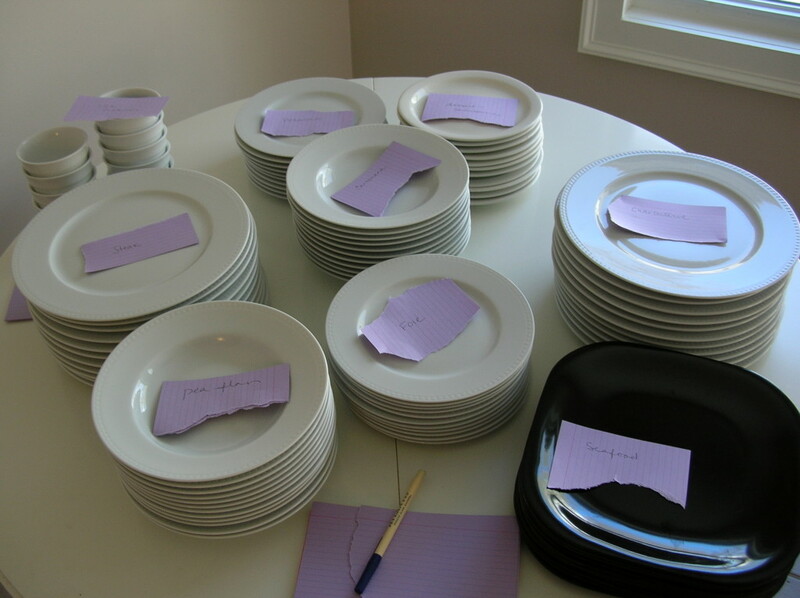 This way all dishes are pre-soaked, they are NOT stacked in the sink, they are OUT OF SIGHT and can WAIT until the party is OVER. Plates and Dishes labeled with destinations! Additionally I try to keep ingredients for each dish near each other in the fridge or on the counters. If I have dishes (such as the green beans) that will be made right before serving dinner- I get the pot/pan, serving dish, serving utensils all out and put them next to each other with a slip of paper that says “green beans”. Most likely I will have the vinaigrette assembled ahead of time, so that will be in a tupperware or at the bottom of the serving dish, ready to go. The beans themselves will be cleaned and in a zip-top bag, also near by. Items that need reheating will have notes on them with times and temperatures- that way I can delegate throwing things into the oven. Speaking of the oven, I only have one. How do I manage this? We cook our turkey on the grill. I searched high and low for a photo of this- but what we do is use a roasting pan, place the turkey on a bed of veggies, light half of our gas grill to medium/high and roast the turkey as if the grill was an oven. We watch the temperature carefully and use a method that begins at a higher heat (450 or so) and then lower the heat to 325ish. We use a probe thermometer to monitor the internal temperature of the turkey. For additional “oven” space, we use our vertical smoker (without the wood of course) as a warming box, which can keep several side dishes like mashed potatoes piping hot. Tables set up in the Dining Room- we get these tables at Costco- I LOVE them. 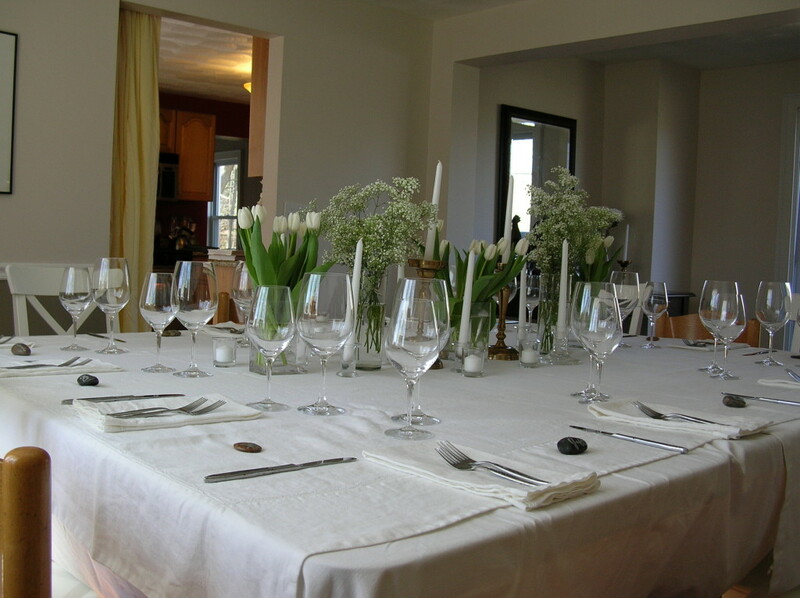 This table is not from T-day, but is a good example of making sure that the stage is set ahead of when guests arrive. By 2 PM on T-day I will be totally ready for entertaining, and everything that is remaining to be done in the kitchen will be prepped and organized in an easy to follow manner. Now, do things get away from me? Sure. But what is most important is that you set yourself up for success- that way if you hit a stumbling block (turkey that won’t cook/come up to temp., a missing ingredient, etc) your entire plan and timeline won’t come crashing down. 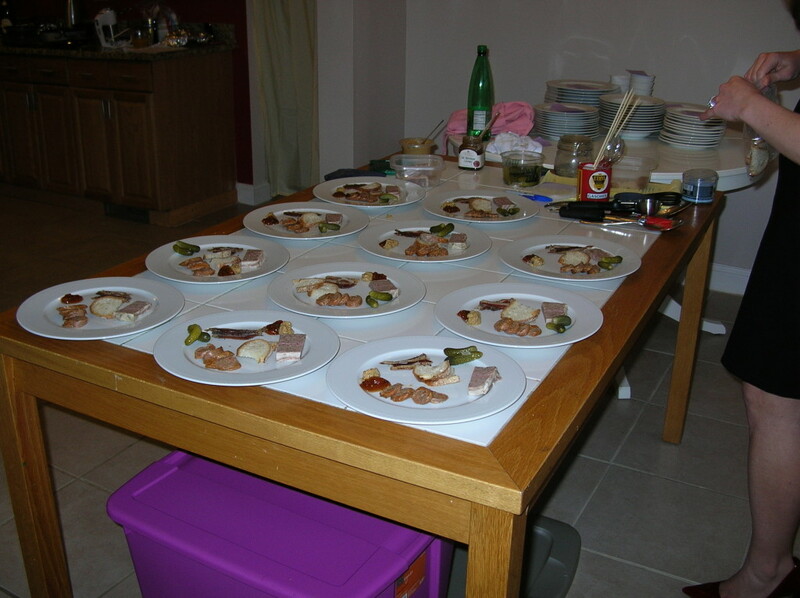 This entry was posted in Cooking, Entertaining and tagged organization, planning, thanksgiving. Bookmark the permalink. I am so impressed with your organization! I love your table set up. Good luck this year!